It's not hard to see why goats were among the first domesticated animals: They're excellent sources of meat and milk. Meanwhile, they have personalities that enchant or enrage. In spite of ages of husbandry, the goat isn't designed to live forever and is prone to illness. A sure sign of a sick goat is refusal to chew cud. Goats, like cows and sheep, are ruminants. They have four stomachs -- the rumen, reticulum, omasum and abomasum -- each with a different function. Goats swallow their food practically whole as they graze, sending it to the rumen, a critical chamber where bacteria and protozoa break down fiber. Later, at rest, a goat will regurgitate the broken-down food to his mouth, mixing it with saliva and chewing what's at this point called cud. Chewing cud is a necessary digestive step for ruminants. Digestive problems typically begin in the rumen. One reason for a goat to stop chewing cud is bloat, a condition where gas gets trapped in the rumen. Goat bloat is something like painful gas in humans, except in goats it can be fatal. Normally, goats belch numerous times per hour, but various issues can impede the gases' release. Treatment includes raising the forelimbs, massaging the belly and administering baking soda, but dire cases may require a veterinarian to administer a catheter. 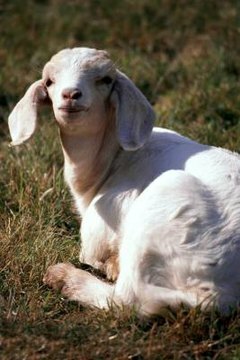 Acidosis is a condition whereby a goat's rumen pH becomes acidic, the effect of improper carbohydrate fermentation. The condition is also known as “grain overload,” because it's caused by dramatic changes to a goat's diet. Though intensive veterinary procedures may save an affected goat's life, the best cure is prevention. Don't change a goat's diet, never feed him corn -- a goat will always overeat corn -- and let him pasture as much as possible. The iconic image of a goat chewing on a tin can isn't far from reality -- goats will eat just about anything. It's the goat herder's constant challenge to ensure his animal doesn't have access to harmful objects, but it's impossible to prevent every piece of litter from blowing across an open pasture. As plastic bags are a ubiquitous reality, it's important to note that goats sometimes swallow the multicolored things, blocking the rumen and wreaking digestive chaos. Rumen blockage of any kind is a serious issue that requires a hasty call to the veterinarian.